It’s time to eat tomatoes! We are in the thick of the season, so can them, obsess over them, bathe in them – because this time is fleeting. But you probably already know this. Maybe you’re even a little sick of gazpacho and caprese and tomato sandwiches by now. 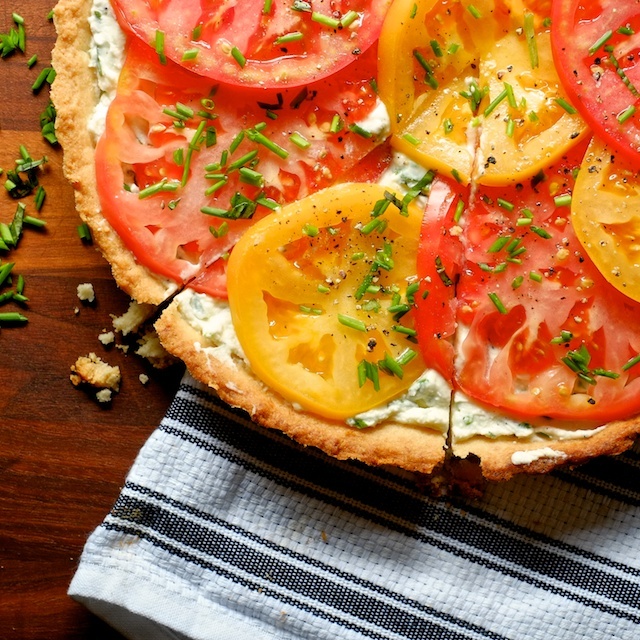 But you also know that by the crisp end of fall you’ll be wistfully reminiscing about the perfectly meaty, juicy tomatoes of summer, so to you I propose a new way to maximize tomato season: the fresh tomato tart. 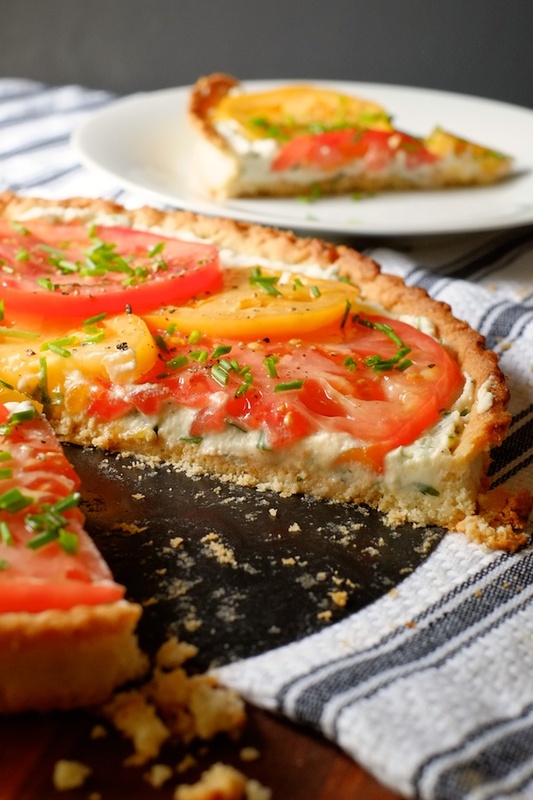 There are a lot of tomato tarts out there, but most of them suggest baking the tomatoes in the crust. But cooked tomatoes are for the off-season. Summer tomatoes should not be trifled with. Eat them raw. 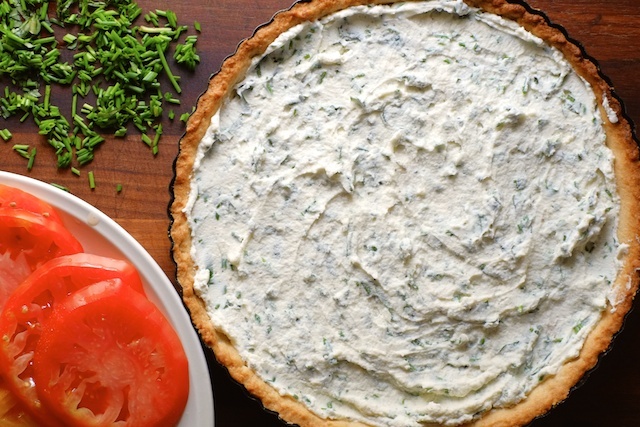 Blind bake a pie crust, whip up some mascarpone cheese with lemon juice, chives, basil, and salt, and lay on slabs of heirloom beauties. I am so serious about tomatoes right now. 1. 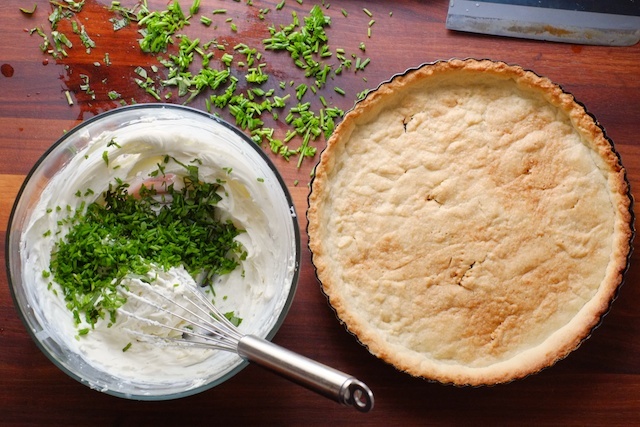 Press your pie crust into a tart pan (preferably with a removable bottom – but you’ll survive without it) dock the dough and blind bake it using your favorite method (instructions will be included if you use packaged pie dough). Or if you are making your own crust (bravo) use this blind-baking method. 2. In a mixing bowl, whip your mascarpone cheese with a whisk until light and fluffy. Stir in lemon juice, basil, and most of your chives (reserve some for topping). Add salt and pepper to taste. Spread cheese into bottom of baked tart crust. 3. 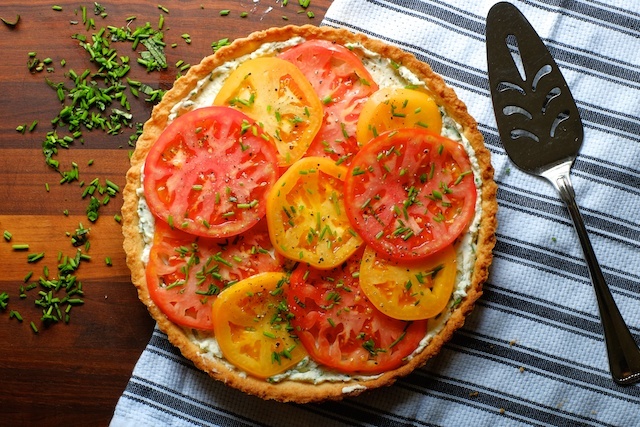 Cut your tomatoes into round slabs, spread them on your cutting board and salt them. Then, layer your cut tomatoes in some sort of aesthetically pleasing manner, and scatter them with chives and more black pepper. Cut into wedges and eat as quickly as possible (because fresh tomatoes don’t do so well in the fridge). This is so absolutely perfect. I could eat tomatoes like apples, can't wait to try it! Thanks Lauren. Tomato lovers unite! And eat tarts! This is so beautiful and pretty much everything I'm wanting in a meal right now! Thanks Melissa! It's a good blend of freshness and richness. I hope you like it if you get a chance to make it!